This season’s little Chloé girl takes her cues from the Maison’s tomboyish roots. A pretty palette of slate grey, powder blue and soft pink speaks of girlish innocence, as do the silk dresses with ruffles and billowing dresses and blouses with guipure lace details that add to this season’s easy allure. Fall-Winter calls for warmer separates and mirroring her mother’s style, this season’s little girl is wrapped in chunky woollen scarves, cropped knitted jumpers and her very own Chloé cape. Girls slate blue check wool cape by Chloé. 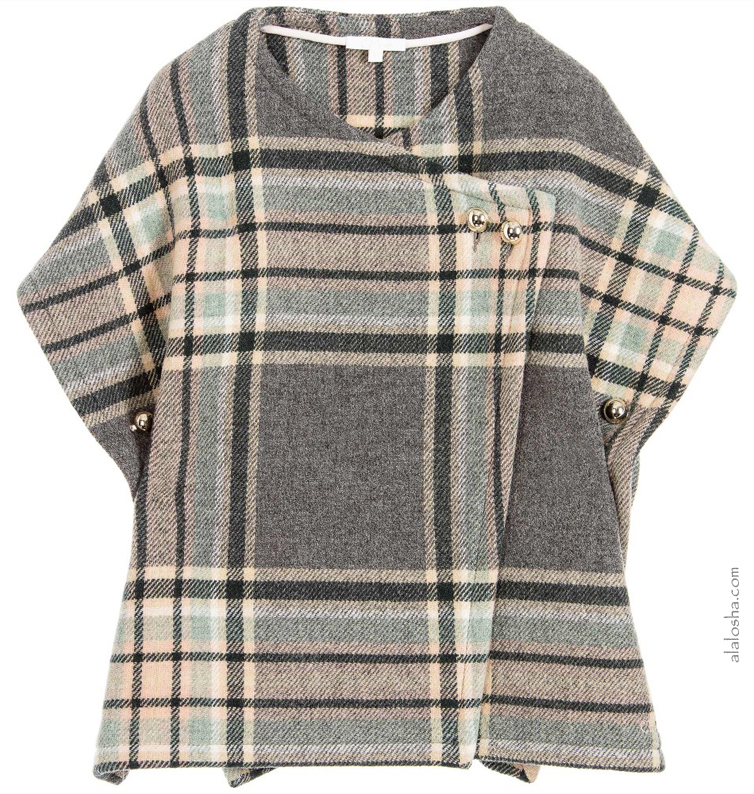 This beautiful woolen cape is woven in broadcloth in a grey and pale pink check. It fastens across the front with gold-coloured engraved buttons and has button fastenings at the sides, in a design inspired by the adult collection. 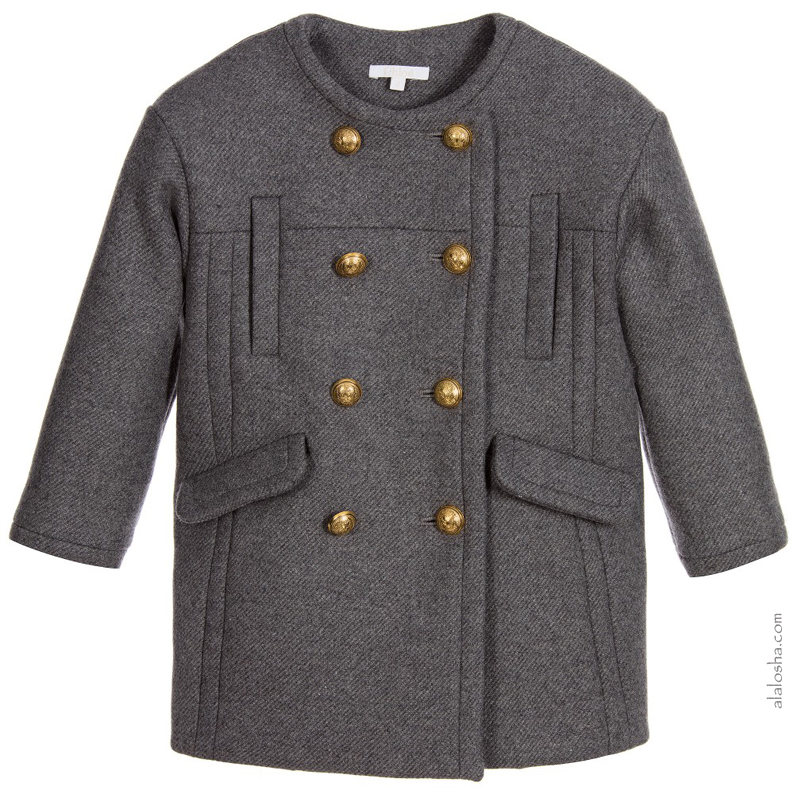 Girls chic grey flannel Chloé coat with gold logo engraved buttons on the front to fasten. Made in a softly textured wool with a soft pink cotton twill lining and light padding for additional warmth, perfect for winter months. The coat is a take down inspired style from the Women's collection. 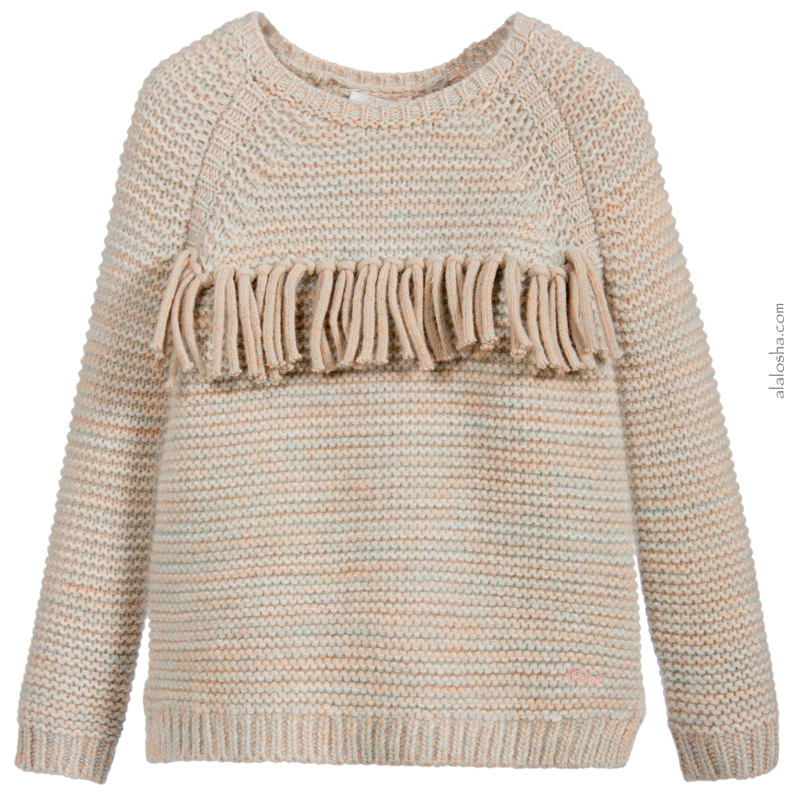 Girls long-sleeved Chloé sweater with fringing on the front and a pink embroidered logo. Made in a soft chunky knitted wool, it has interwoven tones of pale blue and beige. Perfect for wearing with trousers or a skirt, whilst providing a comfortable extra layer of warmth. 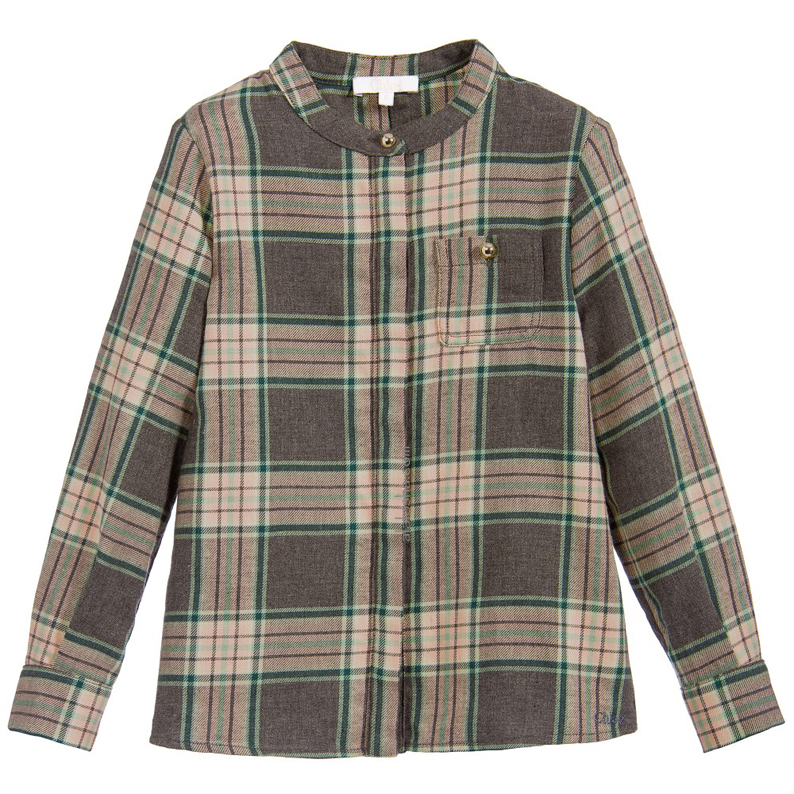 Girls grey long-sleeved Chloé blouse in a classic green and pink check. Made in a soft cotton twill, it has concealed buttons at the front to fasten. There are shiny gold button studs on the cuffs, chest pocket and collar for an elegant finish. Perfect for smart or casual occasions, it would look great tucked into a high waisted skirt or trousers. Pair with jeans for a comfortable casual look. Girls navy blue floral Chloé trousers with an woven white and yellow floral pattern. Made a soft velour blend of viscose and silk with an elasticated waistband and cuffs, ideal for growing young girls. They are fully lined in a soft viscose twill, for an extra layer of warmth and comfort. Girls grey Chloé sweater with a ribbed turtle-neck, cuffs and hem. 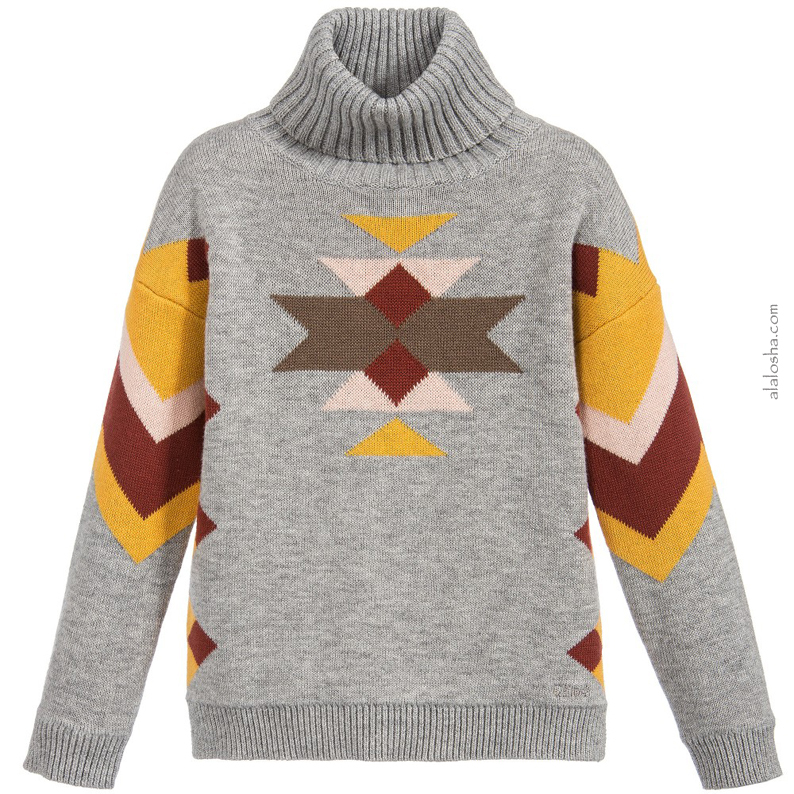 Made in a knitted blend of cotton and wool, it is double layered for additional warmth. In contrasting tones of pale pink, yellow and brown, it has an interwoven zigzag pattern. 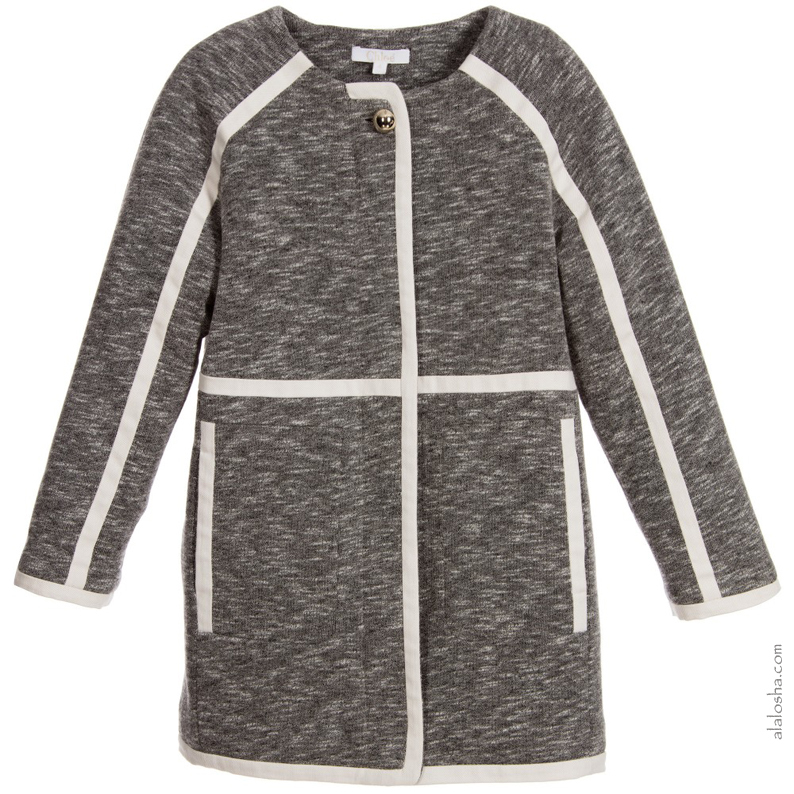 Girls grey long-sleeved Chloé coat with white cotton trim. Made in a soft blend of cotton and viscose with a zip and poppers fastening at the front. It is lined in a super soft synthetic fur for extra warmth and comfort, perfect for winter months.